About a million pens are sold a year and they range in price from $5 to $150. The famous Fisher Space Pens have been used by NASA astronauts on every manned space mission for the last 50 years. 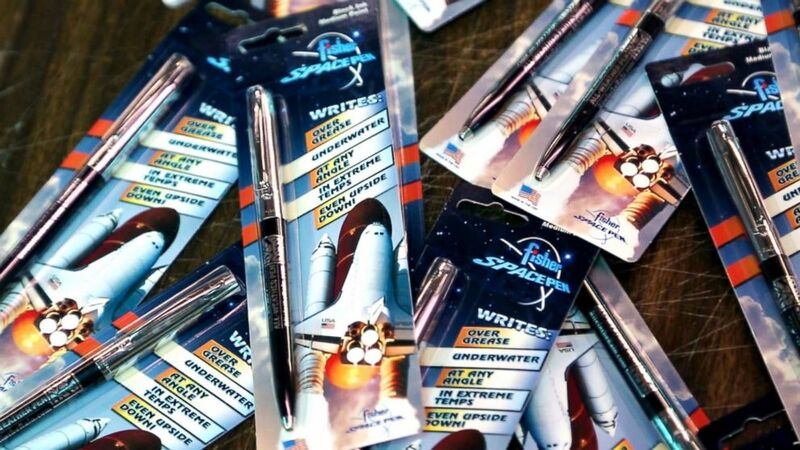 "This is the original astronaut space pen used on all man's space flights -- American and Russian," Matt Fisher, the company's vice president of sales and marketing, as well as the inventor's grandson, told ABC News. On its website, NASA said the Space Pen "functioned in a weightless environment, underwater, in other liquids, and in temperature extremes." Matt Fisher said his grandfather, Paul Fisher, was "one of the original pioneers" in the ball pen business, starting the Fisher Pen Co. in 1948. (ABC News) The pens are made in Boulder City, Nev., about 30 miles outside of Las Vegas, and 65 workers make up to 30,000 pens a day. "It actually took us probably about another 20 years after we got the pen to really get it right," Matt Fisher said. "There’s a 100-year shelf life so they write forever. Well, not forever, 100 years." The pens are made in Boulder City, Nevada, about 30 miles outside of Las Vegas, and 65 workers make up to 30,000 pens a day. "It's shocking to everyone to know that little Old Boulder City has a great, American-made company here," worker Christy Hess said. The process to make the pens is simple. First, stainless steel is cut into the pen tips. Each batch is then checked for quality control under a microscope before being cleaned and sent to another station. There, they are attached to Fisher's patented pressurized ink cartridge and sent to assembly. 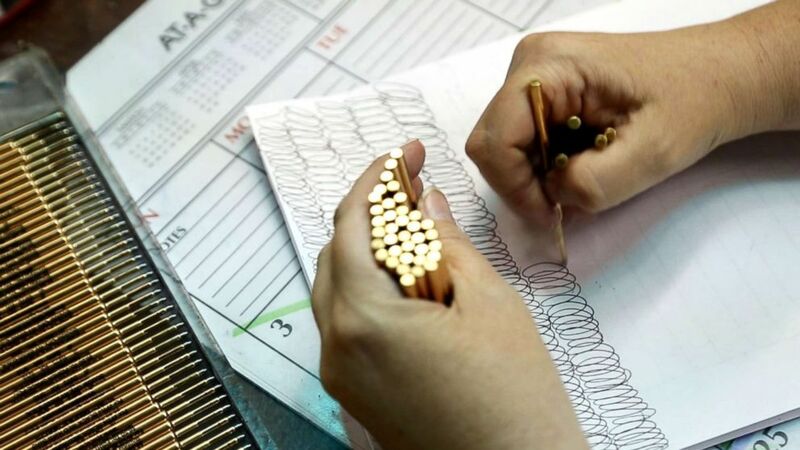 Each pen is put together by hand. About a million pens are sold a year, Matt Fisher said. They range in price from $5 to $150. (ABC News) About a million pens are sold a year, according to the company. 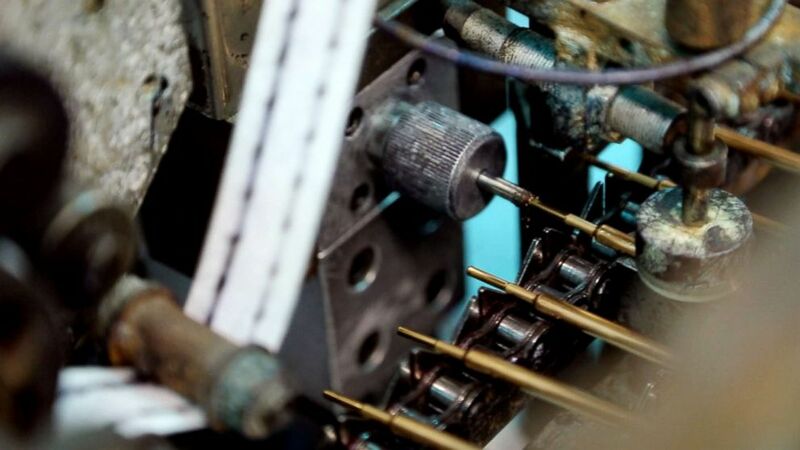 "We make our own inks, we make our own points, we make our own connectors and we source the barrels from the East Coast and clips," said Cary Fisher, co-owner and son of the original inventor. Lisa Marshall, an employee of the company for 10 years, said Fisher was a family. "It's a wonderful place with wonderful people," she said. "Family and friends love space pens. ... Everybody's heard of them and there's a lot of people that have them." (ABC News) The pens, which use Fisher's patented pressurized ink cartridge, range in price from $5 to $150.